Newly developed alloy, non-magnetic and non-corrosive, resists temperatures to 550°C, extra hard tips but very elastic in nature, 8 styles. SS, NM-SS, CS, Ti. Available in 8 styles and many finishes and metals. Finest Tips for handling extremely minute, delicate material and grids. SS, NM-SS, PTFE coated SS, CS. Available in 16 styles and many finishes. Suitable for most general laboratory use. CS. 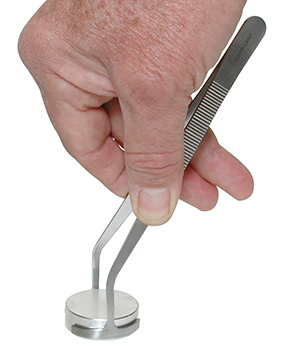 Precision cutting tweezers for fine wire in electronics and thin film research. 9 cutting tips available. SS. Can be sterilized at 180°, satin finish, machined grips, 3 styles, one style available with clamping ring. NM-SS (Dumoxel). Can be sterilized at 180°, 2 styles. Finest Tips for handling extremely minute, delicate material and grids. SS, NM-SS. 13 styles. All but 2 are epoxy coated (blue for SS and green for NM-SS) with exposed, non coated tips. SS, NM-SS. 5 styles. Anti-acid, work-hardened stainless steel tips, equal in strength to flame-hardened carbon steel. SS, NM-SS. 11 styles and various finishes and composition. Biology and High Precision. NM-SS. 14 styles. Fine brushed finish, a value for the price. Not intended for TEM grids. SS. 2 styles Good standard utility use but not honed for EM grid handling. NM-SS. 3 styles. Fine tipped tweezers without the excess bulk of long tweezers. Ideal in tight spaces. NM-SS. 7 styles. Super slim tweezers, precise, fine tips. Especially suitable for reaching in tight spaces, or for working near heat sources. SS, NM-SS. 2 styles. Larger utility size with plastic grips and rounded tips for various laboratory functions. 11 styles. Anti-acid, non-magnetic stainless steel. 8 styles. Anti-acid, non-magnetic stainless steel. SS. 9 styles. Smooth, scratch-proof tips, useful for handling delicate and pressure sensitive parts. 12 styles. Anti-acid, non-magnetic stainless steel, plated with 2 microns of pure 24-carat gold. 5 styles. SS handles with zirconia ceramic tips. Anti-magnetic, non-conducting, chemical resistant, heat resistant (1000° C), lightweight. Ti. 6 styles. Light weight, strong tweezers. Totally non-magnetic. For general lab applications. 13 styles. Scratch proof, polyamide / carbon fiber tips, specially designed to handle sensitive parts, 4 styles. Standard all stainless steel, stainless steel with curved plastic tips and stainless steel with replaceable ESD safe PTFE tips. 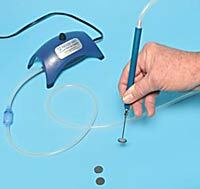 Electrically conductive, ESD safe tips and non-magnetic SS grips. 25 styles. Sturdy but non-scratching. Outstanding chemical resistance. Ti. 7 styles. Light weight, strong tweezers. Totally non-magnetic. NM-SS and Ti. 1 style. Designed for handling AFM cantilevers / probes. NM-SS with soft plastic grips. 7 styles. Non-magnetic precision tweezers with soft ESD safe ergonomic grips. Clean room safe. NM-SS with foam grips that are ESD safe. 7 styles plus wire cutter/tab nipper. CS, SS, Ti. 5 styles. Long, thin with serrated tips. Ideal for picking up and placing. Carbon reinforced PVFD and Carbon reinforced Polyamide 66. 6 styles in each material ESD Safe, Cleanroom compatible. Celcon, Ryton, glass-filled Delrin®, Fluorocarbon (CTFE). 29 styles. Tips include sharp, flat and wafer. Most are chemical resistant, some are static dissipative (ESD safe) and temperature resistant. 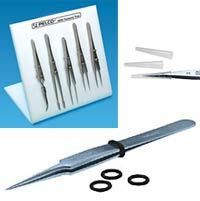 Our offering of tweezers meets a multitude of applications in science, research and industry. Observe the high quality DUMONT® tweezers increased in styles and numbers. Below is a list depicting metals and the codes used to distinguish them. The representative tweezers’ groups are listed above for a fast link to the specific types. The tweezer points measurements should be considered for your application. For example, the sharpest, smallest point (new in this catalog and on our web) is number 505-U, which is stainless steel with points of size 0.025 x 0.005mm. This is a special tweezer suited, for example, to pickup EM grids off of very smooth surfaces. Most applications will not require such a fine tweezer and your choices are manifold. Dumont Dumostar tweezers are the hardest tweezer. They are non-magnetic with corrosion resistant steel (sea water, HCl, H3PO4, HNO3, H2SO4). They are resistant to neutral and alkaline environments. DUMOSTAR from DUMONT is superior to the best stainless steel. Tip hardness is progressive and reaches its peak in the zone of a style 5 tweezer with tip hardness in the Rockwell range of 63-64. Even non-magnetic steel alloys can exhibit magnetism when exposed to strong magnetic fields. 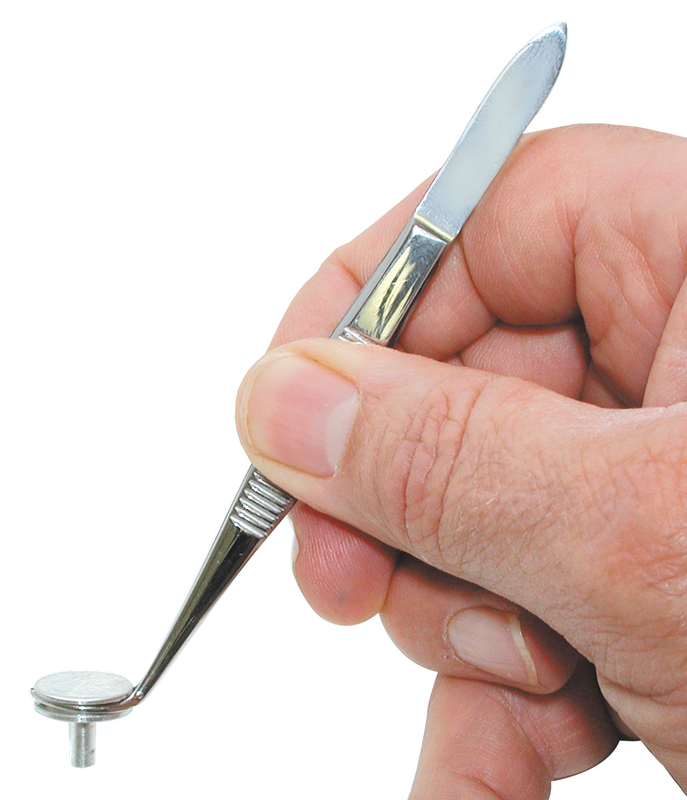 Only titanium or plastic tweezers are fully non-magnetic. An alloy blend of steel, chromium, nickel, and cobalt, elastic in nature for “flexible fatigue resistant tips”, resists temperatures to 550°C, and is non-magnetic and anti-corrosive. The best overall material for tweezers. Rockwell 63-64. High tensile strength chromium/carbon steel alloy (various compositions) provides for good corrosion and stain resistance, second in hardness only to DUMOSTAR Note: stainless steel can rust under some circumstances. Same properties of stainless steel with additional nickel to create the non-magnetic characteristic. A standard alloy composed of C, Cr, Ni and Mo. It offers a good resistance to corrosion thanks to its high concentration of Mo and is 80% non-magnetic, but it is not as hard as NM-stainless steel. NM is resistant up to temperatures of around 400°C (DIN 50 914) and is suitable for autoclave sterilization at 270°C. Flexible tips, non-magnetic, light weight (33% less than stainless steel alloys), durable, low particle shedding compared to stainless steel, extremely acid and stain resistant, hypoallergenic. Good for use around sensitive electronics or high magnetic fields. Will resist temperatures in excess of 400°C. Rockwell 36. Very durable, hard material that is less flexible and more brittle than DS, SS and Ti. Highly magnetic, will stain and rust easily. Rockwell 60. Highly corrosive resistant and provides soft, flexible tips. More stain resistant than stainless steel, Rockwell 63 hardness. 95% anti-magnetic, resistant to temperatures above 400°C. Can be autoclaved. Composed of a special mix of Carbon Steel and Chromium. Provides soft, flexible tips, Rockwell 55. Note: For complete description of plastic materials for tweezers, go to the beginning of "Plastic Tweezers".